In the worse year of the Great Depression, Chicago tried to repeat its success of 1893 by hosting another world fair. Despite the very grim economic situation, 48 million people visited the fair over its two year lifetime. 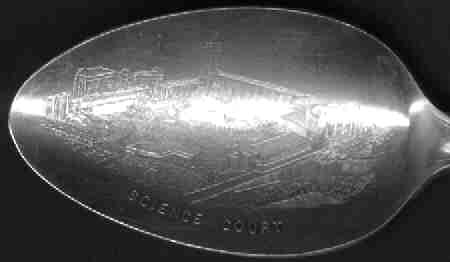 The theme of the fair was scientific technology and progress (1833-1933), because it was hoped that new technology would pull the economy out of the depression. The dependence on machines and industry was quite pronounced and there was a widespread acceptance of mass production and mass produced items. The "look" of the fair was "minimalist". Buildings had flat walls, no windows, no applied ornament and an asymmetrical layout. New construction techniques were used in several of the fair buildings. The new look did not affect the real world as had the Columbian World Fair architecture. The fair organizers used strong management to create a coherent set of displays. The diversity of previous fairs was changed into a very regulated look that was consistent from one exhibit to another. This look included color, lighting and architectural elements. It is the same thought that applies to most modern franchises. "People returned home with any and every type of token, trinket, or other piece of random memorabilia that captured the imagination, all bearing the Fair's logo." From spoons to beer coasters to letter-openers, tie-clasps to ashtrays, the essence of these objects was more than just that of simple utilitarian tools. Perhaps to defy the "economic gods", people flocked to the Fair, spending their hard-earned and severely reduced incomes on rather useless objects. Many collectors specialize in memorabilia from this fair. 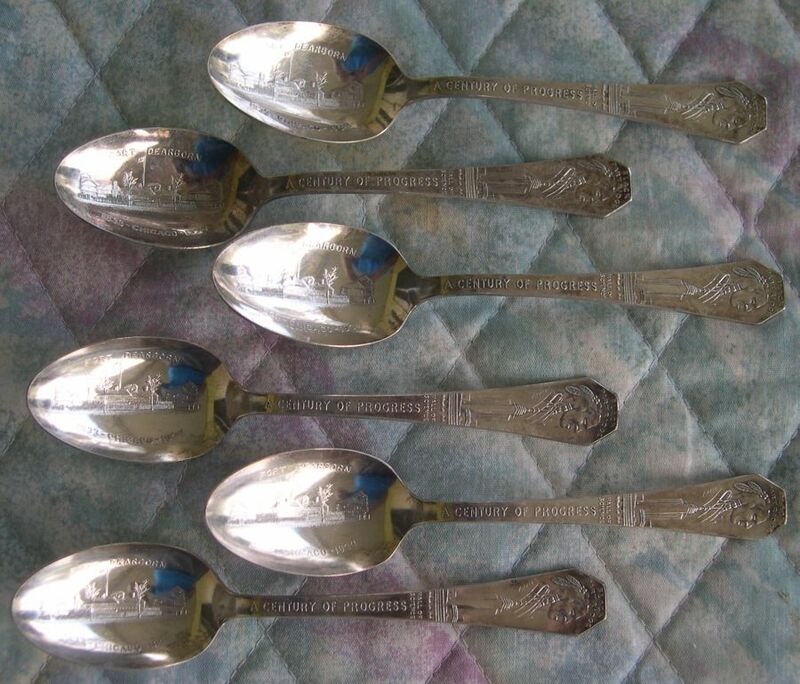 Sterling silver objects were not eagerly sought after during this financial debacle and sterling silver spoons are not readily available. 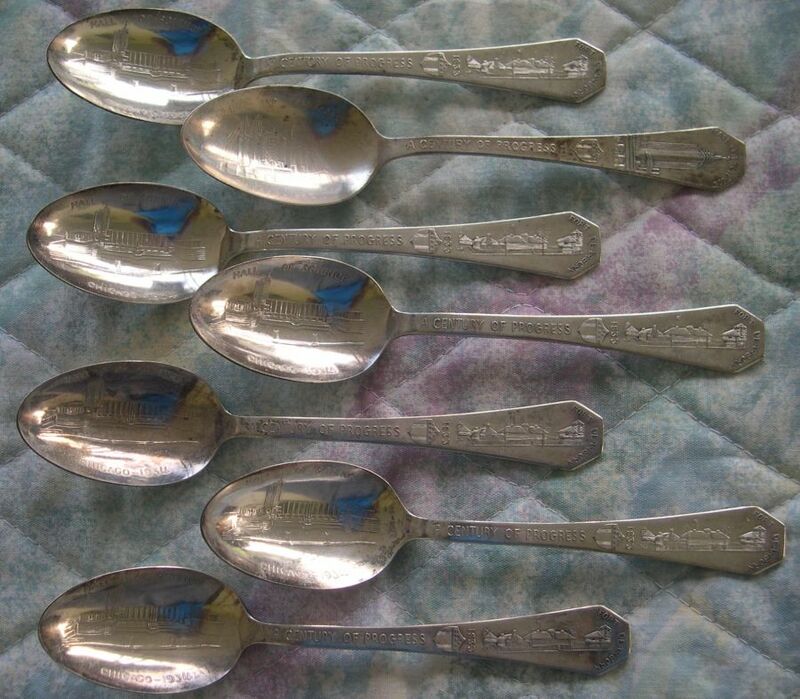 These are the only few sterling spoons of which I am aware, although others may exist. Front and back views of the spoons. Century of Progress, Chinese Temple and Carillon tower on the front. 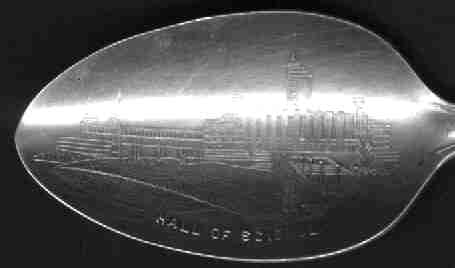 This is a very pretty enameled and gold plated (not sterling) spoon featuring the Carillon Tower and "A Century of Progress" on the front. The mark on this spoon looks to me like it was designed to confuse people. 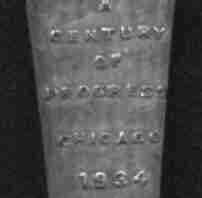 It shows a "crown,B,lion" all within one cartouche. I suspect that it was designed to look like British marks and make people think that it was sterling. 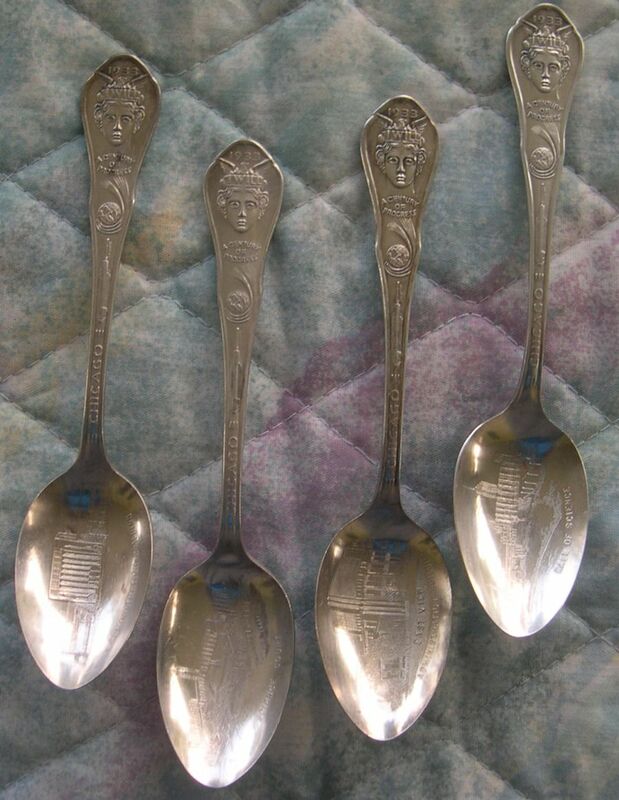 I have seen a number of silver plated souvenir spoons from this world fair, but I have not avidly collected them. I am quite sure that a number of other examples exist. For your information I have reproduced four of them below. 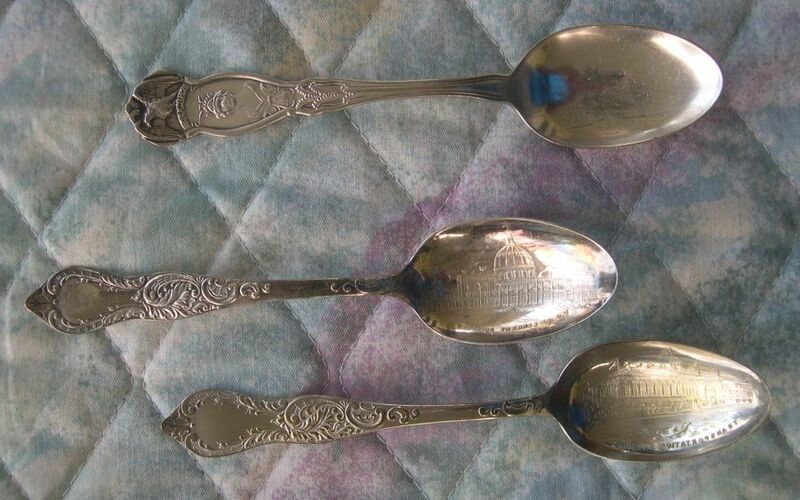 These spoons are neither expensive nor rare but because some people collect world fair memorabilia, they are slightly more costly than other silver plated spoons. The stem on these spoons is the same. 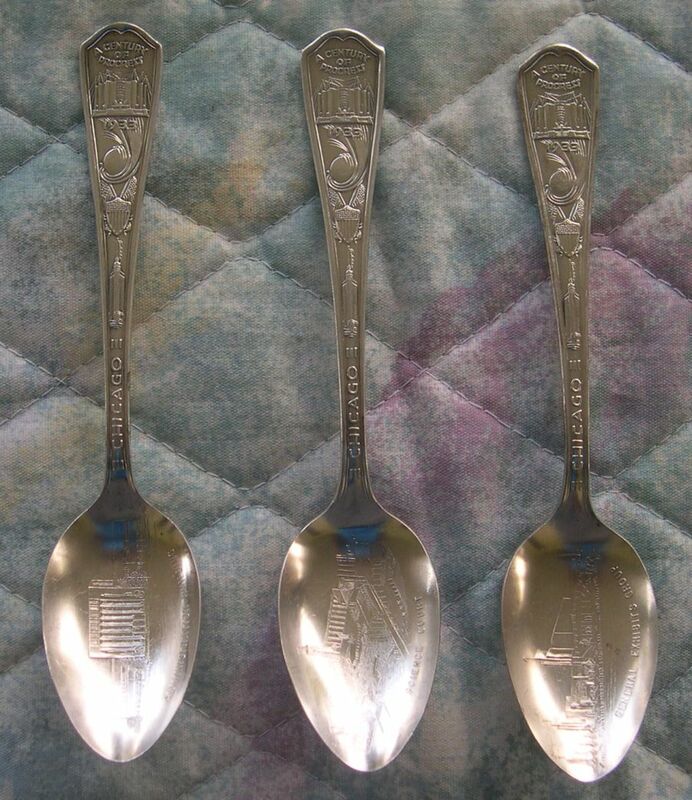 They are marked "Oneida Community Par Plate"
two bottom spoons manufactured by Leonard Mfg. Co.
At the finial is an indian identified as Black Partridge and below is image is a building identified as the 'hall of science'. 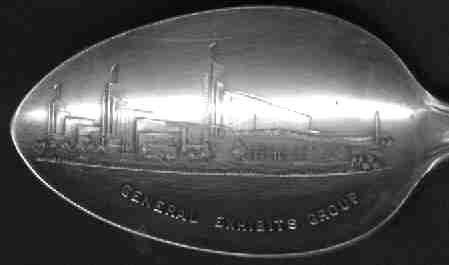 Manufactured by Century Silver Plate. Black Partridge was a chief of the Potawatomi band of indians and was a participant in the Northwest Indian War and the Peoria War. He was considered to be a friend of American settlers in the area and tried to protect Americans at the 'Fort Dearborn Massacre'. 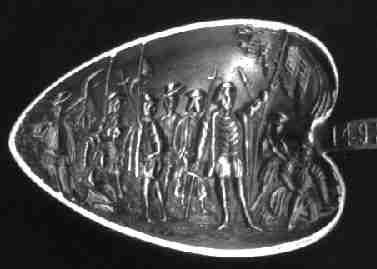 General 'Mad' Anthony Wayne presented him with an engraved silver medal of George Washington at the Treaty of Greenville in 1795.